There are a few days in the year, when we are able to fully dedicate, celebrate and revel in the magnificence of our planet, our environment and the plethora of life that exists upon it. Along with this, these days are used as a platform to spread awareness on multiple issues that are harming the environment and causing life forms to suffer unnecessary pain. We should all make it a point to actively participate and create events that will garner empathy, spread awareness and further promote action in the direction that will help improve and maintain the environment rather than simply taking advantage of it. STRAW would be happy to assist you to organize events for your school or community to promote compassion and empathy towards animals and a sense of responsibility towards our planet. Some of the important International Commemorative Days Concerning Environment include, Earth Day, World Environment Day, World Vegetarian Day, World Farm Animals Day and World Animal Day. It is celebrated every year on 4th October. Commencing in 1931 at a convention of ecologists who wished to highlight the plight of endangered species, it has become a day where animal life in all its forms is celebrated all over the world by organizing special events. The 4th of October was chosen for World Animal Day because it is the feast day of Francis of Assisi, a nature lover and patron saint of animals and the environment. The birthday of Mahatma Gandhi, October 2nd, is also observed as the World Farm Animals Day all over the world. Drawing from his teachings on non-violence towards all living beings, vegetarians and animal activists worldwide have adequate inspiration to protest the cruelty meted out to animals specifically raised in farms as food. The World Farm Animals movement designated 2nd October as a worldwide annual protest against factory farms and slaughterhouses to voice their discontent towards the cruel slaughter of animals for consumption. Approximately 58 billion animals are killed in factory farms and slaughterhouses worldwide to produce meat, eggs, and dairy. World Vegetarian Day is celebrated globally on October 1st. It brings worldwide attention to the health and environmental benefits of vegetarianism and highlights the ethical and humanitarian aspects of following a vegetarian lifestyle. The unofficial holiday encourages people to avoid eating foods that include animal products and to adopt a plant-based diet. The day was established by the North American Vegetarian Society in 1977 and endorsed by the International Vegetarian Union in 1978. World Environment Day (WED) is the United Nations’ most important day for encouraging worldwide awareness and action for the protection of our environment. It is observed worldwide on June 5th every year to raise global awareness and to take positive environmental action to protect nature and the planet. It stimulates overall awareness of the environment and enhances political attention and action. It is run by the United Nations Environment Program (UNEP). Since it began in 1974, it has grown to become a global platform for public outreach and it is now widely celebrated in over 100 countries. Earth Day is celebrated annually on April 22nd. Events worldwide are held on this day to demonstrate support for environmental protection. It was first celebrated in 1970, and is now coordinated globally by the Earth Day Network, and celebrated in more than 193 countries world over. Though the World Animal Day is celebrated annually on the 4th of October, in reality it turns out to be the whole week event. Organize an animal-themed painting competition in a class. Organize an animal-themed essay writing competition in a class, similar to one shown on the right. Ask students to bring animal-themed articles, videos, etc. They could even have them downloaded from YouTube, which could be played in the class. Help students launch a school recycling campaign to protect the school habitat and resources that schoolteachers and students share. Ask children to build small shelters with old cartons for the street dogs around their homes so that they would be warm during the winter season. 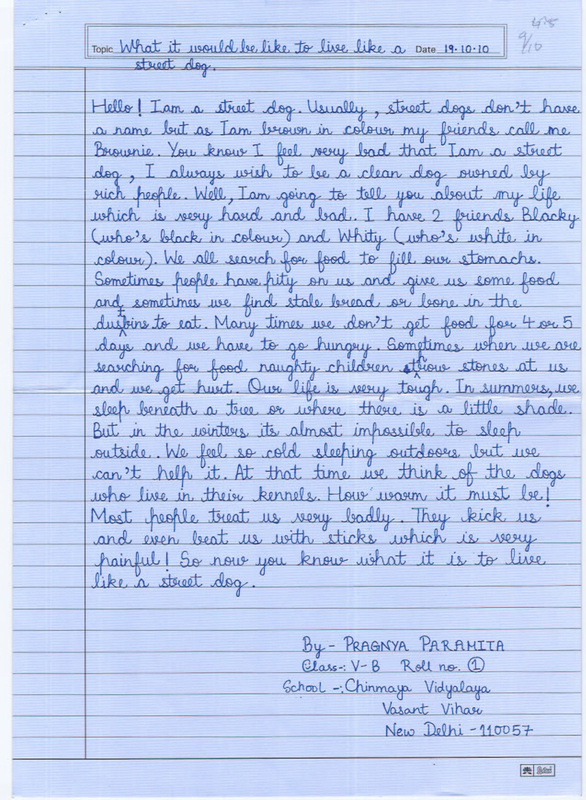 Article Written by a Class V student on Topic: "If I were a Street Dog"